A team of former newspaper staffers in the US have spent the past three years producing a documentary which aims to highlight investigations that had "fallen by the wayside" when the journalists covering them lost their jobs. 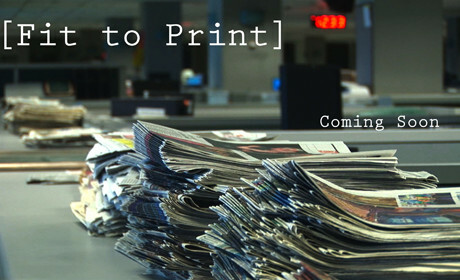 Fit to Print, which is due to be completed by the end of Summer this year, was prompted by cuts within the US newspaper industry and a desire to look at the impact of this, particularly for investigative journalism. Adam Chadwick, a former staffer at the New York Times, is directing the documentary. "We started at the New York Times, we did a bunch of interviews there and then we went to the Washington post, we went to the Los Angeles Times, we did a bunch of filming at newsrooms across the US and focusing on the business model side but also giving a contemporary history of the US newspaper industry and how it changed rather dramatically over the course of roughly 30 or 40 years." The documentary also follows three case studies of investigations "that have fallen by the wayside" due to staffing cuts, he said, including interviews with the journalists who had been reporting the stories and are now following them up and also the other people involved in the stories. "We're trying to get these stories out there, we're trying to get more eyeballs on these stories and shed light on what needs to take place next for these stories." As a result the documentary is "a combination of sit-down interviews with publishers and reporters from across the country, and actual out in the field footage with investigative reporters", he added. Chadwick said the documentary will also assess "the light at the end of the tunnel for the industry through organisations such as ProPublica, Voice of San Diego and other start-ups." Funding for the documentary has largely come out of the pockets of those producing the documentary, he added, as well as some donations "here and there". The group is currently trying to raise completion funds of around $10,000 via new crowdfunding platform Passerby to help "speed up the process". According to the project's page it has currently raised just over $2,000. "The good news is we have everything in the can, everything has been filmed. Right now we're editing everything together. "In order to move forward we do need to raise a certain amount of funding, we're trying to raise $10,000 to secure licensing for our stock footage that we're going to have in the film because we don't want to be sued. We're trying to also raise the funding for our distribution campaign, our marketing, doing technical things on the finished film, sound editing, colour correction, some technical things. "... But the good news is we're in a good position to complete the film." The group is offering a number of awards for donations to the documentary, including a digital download of Fit to Print for donations of $25, a DVD of the documentary and the original score for donations of $40 and a conference call with producer Nancy Wolfe and Chadwick on how to start an independent documentary. Upon completion Chadwick said they will look to "hit the film festival circuit" with the documentary. "We're going to try and submit it to Sundance, as well as other film festivals. In the States and across the world we have journalism schools who have contacted us in regards to this, they want to screen it for classroom purposes so we have a lot of journalism schools involved in this. "We'd like to push it as far as we can take it, hopefully it will have a theatrical release so we plan to do everything that we possibly can to get this project screened." He added that he hopes the documentary can also act as a "warning sign". "No matter where journalism is heading, and I do have hope for the future of online journalism even for the newspaper industry, but we need to look back on history and understand the mistakes that were made so we don't repeat them in a bad way in the future." Below is the documentary's promo clip featuring David Barstow from the The New York Times, Bob Kaiser from The Washington Post, Laura Frank from the now closed Rocky Mountain News and others.